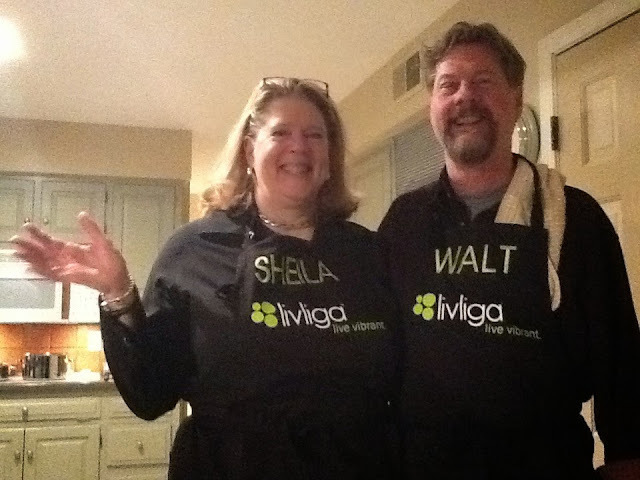 Sheila and Walt making time to cook dinner at home (photo by LivligaHome). We live such busy lives and have so many responsibilities and obligations. Our lives are spent juggling all the have tos. In order to make it all happen, often it is our health that gets sacrificed. We skip exercise to get to work early, we lose another hour of sleep to work on a kid’s school project or we give up on cooking dinner and buy take out instead because our volunteer meeting ran long and we got stuck in traffic. The list of compromises we make to keep the Lifeboat afloat is honestly endless. The problem is, if we don’t put our health at the top of the priority list we end up being able to juggle less and less. We can easily become one of the statistics for diabetes, heart disease, cancer or stroke. It is the reality we hate to think about and avoid talking about. Bottom line, ignoring our health shortens our lives and lessens our quality of life. Ugh. Now comes the moment when we start to feel really overwhelmed. There is so much to change and so little time. Where do we even choose to begin? What one change can be made that will make the biggest difference? The answer is: cook more at home. Cooking at home can have the biggest impact on our health. We can control the variety of food we eat, the ingredients we put into our food and the amounts we serve. Each of these can positively influence our health. Changing up the vegetables, grains and proteins we eat throughout the week ensures we are getting the range of vitamins, minerals and fiber we need to keep our bodies fueled and running smoothly. Making our meals from scratch and following healthy recipes helps us manage the amount of sugar, salt and fat we use. Research shows too much of these ingredients puts us at higher risk for disease. By cooking more at home not only are we able to provide healthier foods but we are also able to control the portions we serve. We can serve up right sized servings, following recommended serving sizes, something that is very hard to do when we eat out or buy prepackaged foods that come in supersized portions. Here is one of my go to dinners --veggie burger, roasted red peppers and Brussels sprouts. Above all you need to find ways to make it possible for you to create and cook healthy at home. Part of what makes it possible is finding a way to enjoy the process. Personally, I found a sense of satisfaction in being organized. I found I spent less money, spent less mental energy worrying about what was going to be for dinner and also spent less time in the car between work, sports and meetings running to the grocery store or the fast food restaurant. I also found the joy in cooking because it made me feel better, made me feel accomplished as I built my skills and, made me love creating colorful, appealing plates of food for me and my family. Then, mainly on the weekends, I have found the fun in conquering a new or more complicated recipe or spend time in baking healthy breads and muffins. Now I create my own recipes just for the fun of it! Finally, you need to believe it is possible and stick to cooking at home until it becomes easier and a regular routine. Look to those who have proven its possible. We can support each other all along the way.